I want to set up to Azure VM web servers as a farm with shared configuration and content being stored in an Azuure File share. 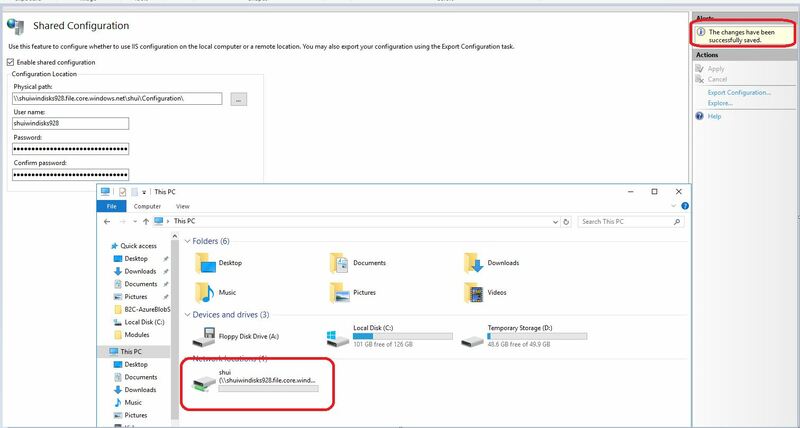 I was able to successfully export the configuration from one IIS to file storage. I can see the 3 files it creates in file storage through the azure portal. The issues I have is when I try and set up iis to use the shared configuration in file storage. I keep getting a Invalid password when I enter the Encryption Keys Password. I swear I entered the same encryption password that I used to export the configuration. Am I supposed to just make up an encryption password or should it be set to something? I test in my lab, I meet the same error with you. I think maybe the blog miss mount file share on VM. When I do this, I get the same result with the blog. Note:Encryption Keys Password is not your file share password. 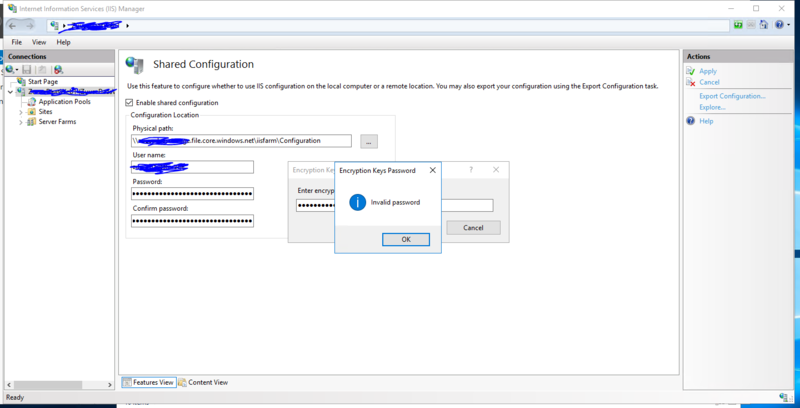 This password is set when you use IIS Manager to export configuration files. Not the answer you're looking for? Browse other questions tagged iis azure share web-farm or ask your own question. Benefits of ARR in a load balanced environment (Azure)?